Heart Disease: What is CVD? CVD is disease caused by narrowing of blood vessels. The manifestations are dependant on which blood vessels are affected. Angina - can be felt as pain or ache in the chest during exercise or when stressed. It occurs when one or more of the coronary arteries are narrowed, restricting blood supply to the heart muscle. Heart attack (Myocardial infarction) - occurs when blood supply to the heart muscle is blocked, causing damage to part of the heart. It presents classically as crushing chest pain radiating to the neck and left arm, not relieved by rest. In women, symptoms of angina and heart attack may present differently; women often experience unusual chest pain, abdominal pain, nausea, shortness of breath and unexplained fatigue. Stroke - occurs when the blood supply to part of the brain is cut off, causing damage to that part of the brain. The effects of this depend on which part and how much of the brain is affected. Peripheral vascular disease - caused by narrowing of the arteries to the peripheries, often the legs, which leads to calf pain on walking. Cardiovascular disease (CVD) - is the leading cause of death in women after the menopause and in fact more women die from heart disease and stroke than the next five causes of death combined, including breast cancer. Although many women perceive that one of the leading concerns to their health is breast cancer, women are nine times more likely to die of CVD than from breast cancer. This should not belittle the importance and seriousness of breast cancer, but should simply raise the awareness of the importance of the magnitude of CVD. CVD is traditionally thought of as being a problem of middle-aged men but in fact, CVD affects just as many, if not more women than men, albeit at on average, a decade later. 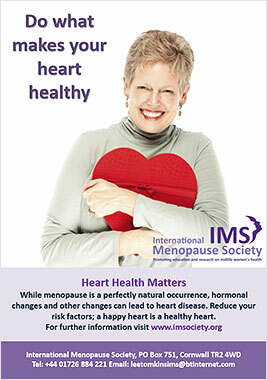 As part of World Menopause Day, the International Menopause Society (IMS) has released a poster and information leaflet.